Our home should inspire us to go out into the world to do great things and then welcome us back for refreshment. Small decor changes make a big impact in a home’s look. No matter how well your place is decorated, organization is key to showing off your great designs. With these best home décor ideas on a budget, just a few small changes make your space seem brand-new. Most of the ideas need the supplies that are already available with you and can be done in literally no time. Display drawings in a colorful frame, or in a white frame with a colored mat. Hang them in an otherwise unimaginative space. They’re full of spirit and meaningful too. 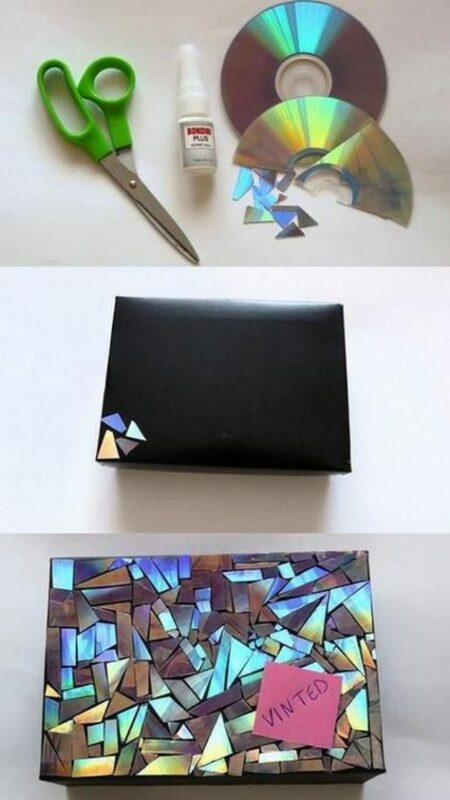 This simple yet so pure form of art can be a great home décor idea on budget and will somehow give your child a confidence to do even better the next time. 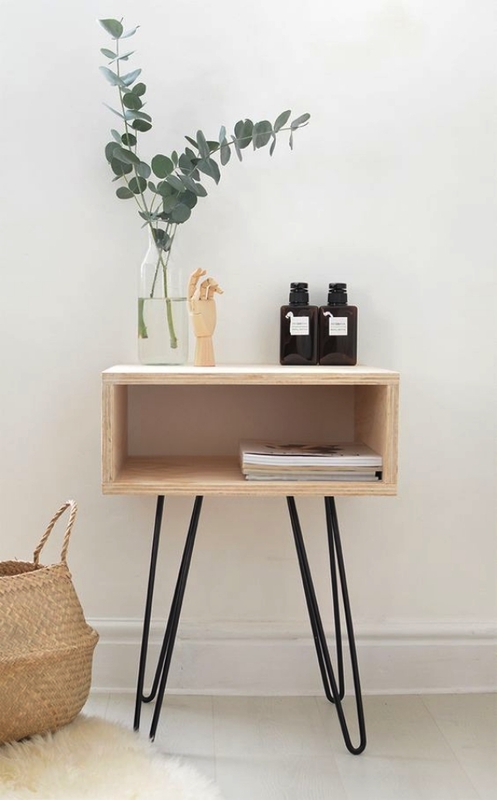 Stack modular storage units to make a stepped side table with surfaces for displays and lighting. Create miniature still lives in the cubbies, or stack reading material that you’re going to get to…someday. 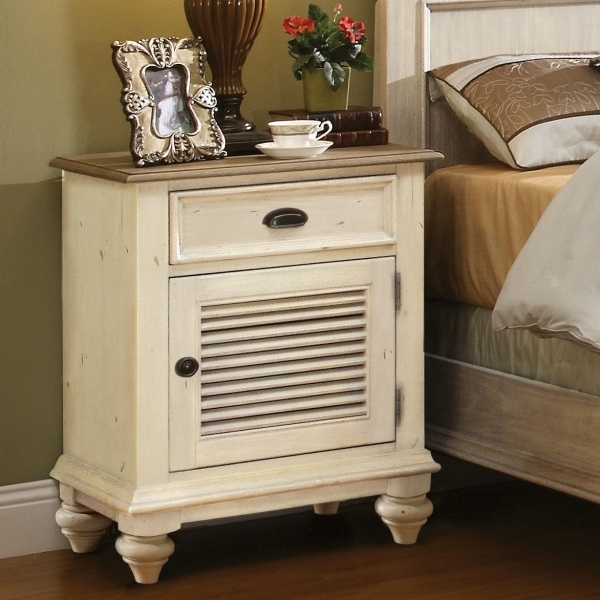 This is a great option both for storage in style and display at its best. You can display some of your favorite reading stuff to let people know about your taste. Existing curtains or pillows look extra luxe with new fringe. Another quick fix? Use leftover wall paint to refresh the frame of an old chair. 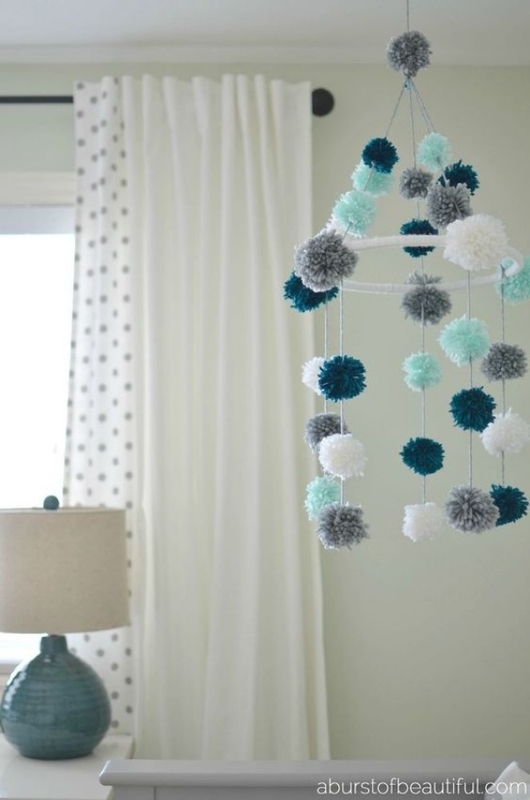 This is probably the easiest and cheapest way to add freshness in your décor as the material required for making pom pom fringe is readily available. Also, if you excel at it and are creative enough to play with different ideas the SEO Agencies are there to help you to take your work to a bigger audience without any hassle. Bonus! 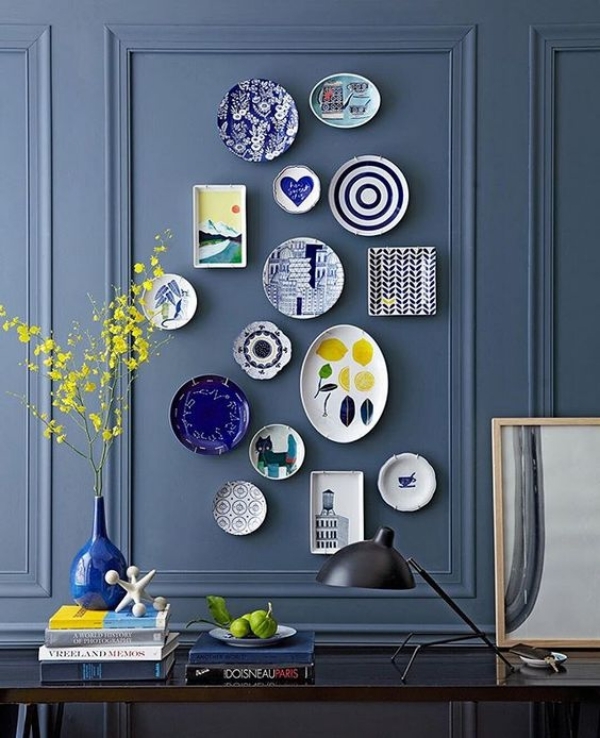 Plates in unexpected colors make a fresh wall arrangement. Vary hues (within a family), sizes, textures. Put the most dramatic plate toward the center (lay out the plates first to experiment); attach wire plate hangers and hang plates on picture nails. 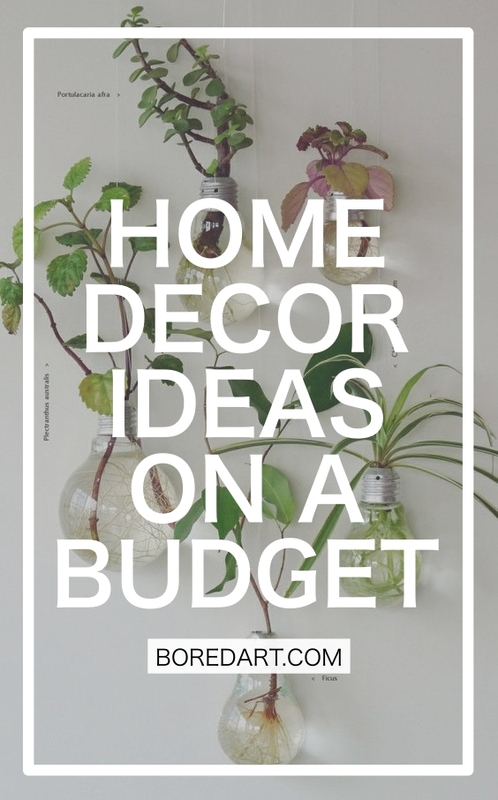 Home décor ideas on budget can’t get simpler and effective than this. 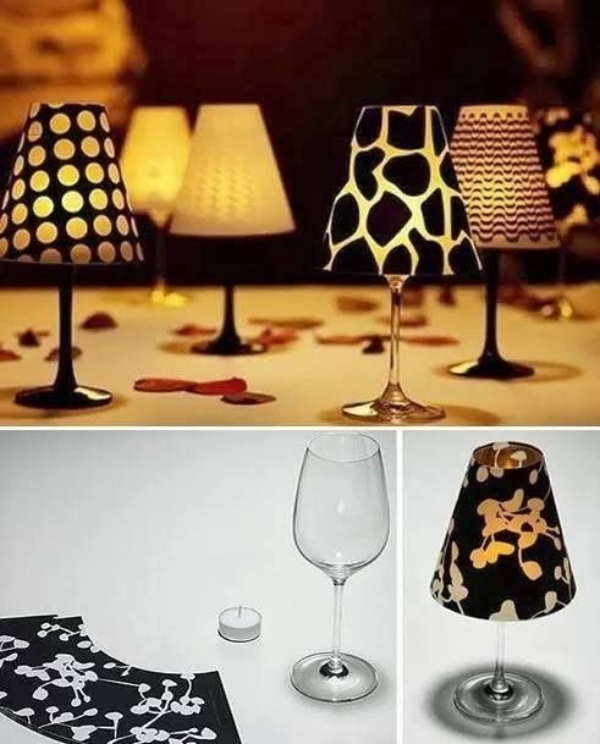 The dinner table shines a little brighter with a few clever “lamps.” Just pop a LED tea light in a wineglass and top with a paper shade. Make your dining table look like an expensive restaurant table setup with this simple home décor idea on a budget. 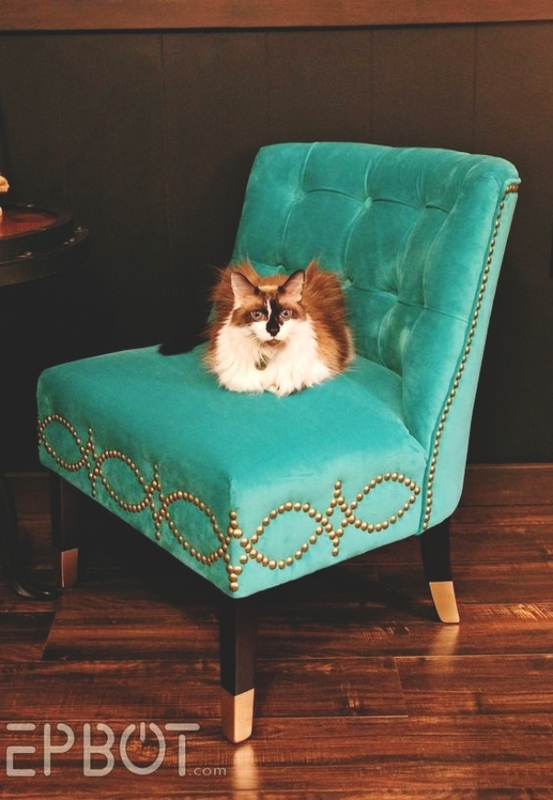 The upholstery tack isn’t just for sofas anymore. 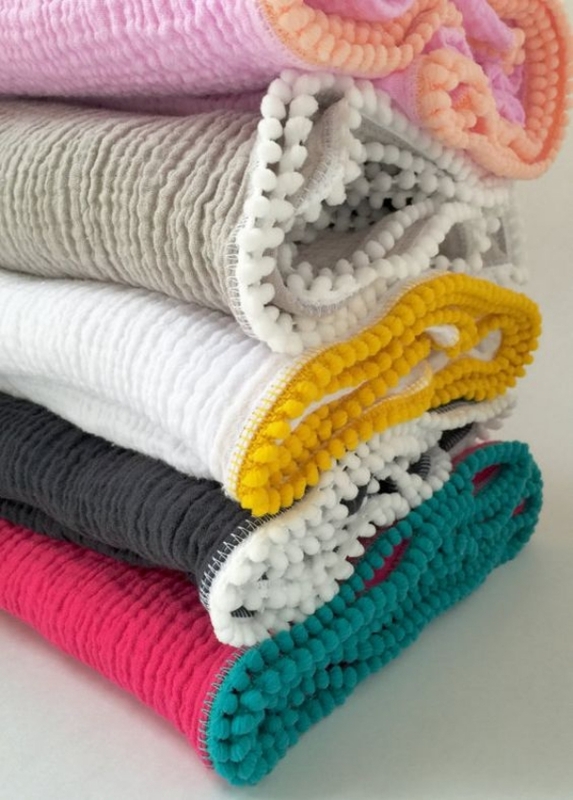 This fabric finisher is back in fashion — and makes an inexpensive way to add pizzazz to plain pieces of wood furniture. 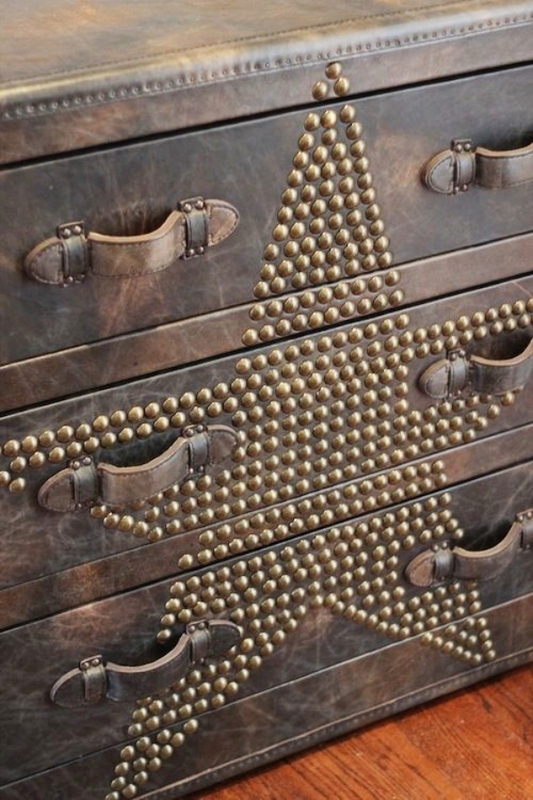 Buy tacks from a hardware or fabric store for about $10 a pack (you can play with two different sizes); push or tap them in along the lines of a table, bench or chair for an eye-catching accent. 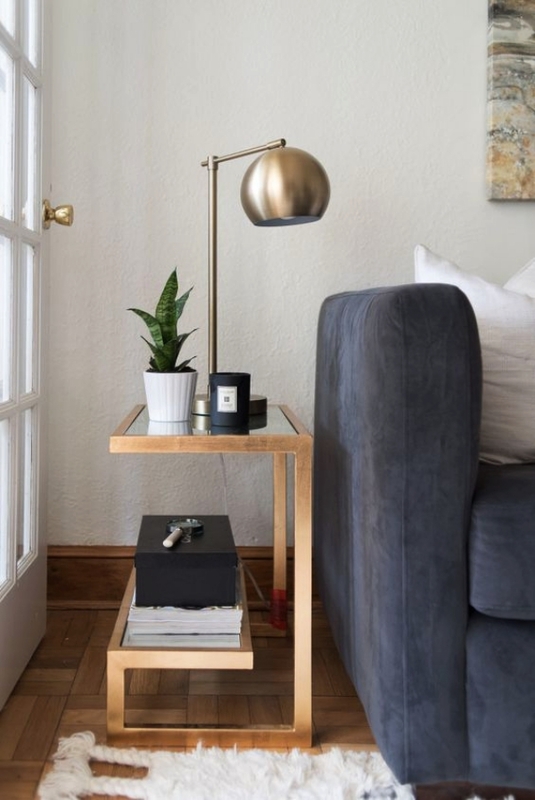 Skip painting and embrace a weathered finish for a tiny table. 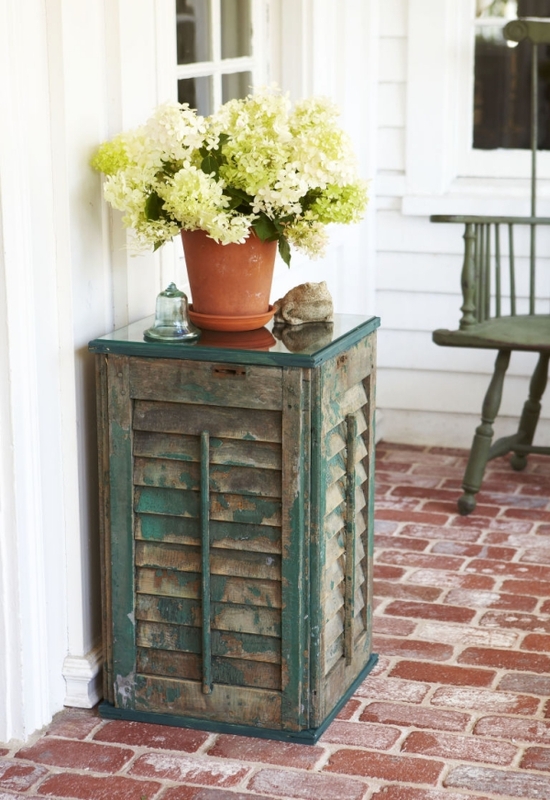 A set of rustic shutters provides the perfect base for a potted plant or a vase of blooms. Handmade and crafty items are a thing these days. People prefer these as a part of their home décor rather than other fancy and super expensive lavish items. The SEO Agency now a day are active enough to promote your craft or even get you the right décor pieces from around the world. 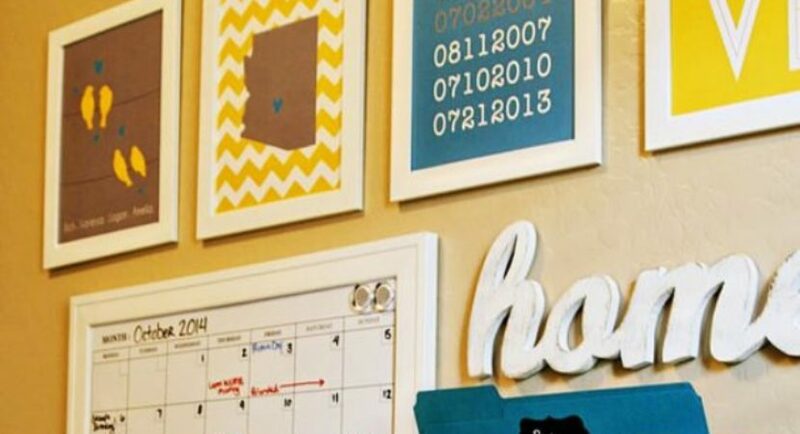 You ca go through some DIY Home Decor Ideas on a Budget to give a shape to your creativity. 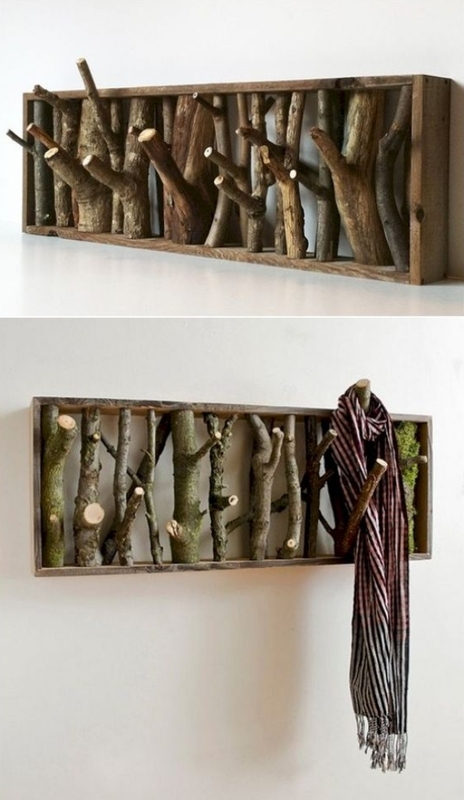 Even few small changes and efforts can liven up any corner of your house. The inspiration is all around and within the house itself. You just have to feel the vibe. Home is not a place, it’s a feeling!